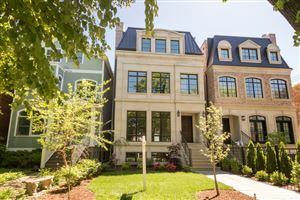 It encompasses a number of neighborhoods, including Lincoln Central, Mid-North, Old Town Triangle, Park West, RANCH Triangle, Sheffield, West DePaul (including half of the Julia C. Lathrop Homes) and Wrightwood Neighbors. The area also includes most of the Clybourn Corridor retail district, which continues into the Near North Side. Lincoln Park neighborhood associations include: Lincoln Central Association, Mid-North Association, Old Town Triangle Association, Park West Community Association, RANCH Triangle Community Conservation Association, Sheffield Neighborhood Association, West DePaul Neighborhood Association, and Wrightwood Neighbors Association. 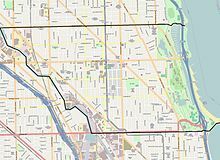 All but the West DePaul Neighborhood Association are affiliated with the Lincoln Park Conservation Association, while the West DePaul Neighborhood Association is affiliated with the Lake View Citizens' Council. Lincoln Park is home to Lincoln Park High School, Francis W. Parker School, and DePaul University. Many students who attend these schools now live in this neighborhood. Lincoln Park is also home to five architecturally significant churches: St. Vincent de Paul Parish, St. Clement Church, St. Josaphat's (one of the many so-called 'Polish Cathedrals' in Chicago), St. James Lutheran Church and St. Michael's Church in the Old Town Triangle area of Lincoln Park. Visible from throughout the neighborhood, these monumental edifices tower over the neighborhood, lending the area much of its charm. Five Lincoln Park churches are affiliated with the Catholic Church (St. Bonaventure Church, Saint Clement Church, St. Michael in Old Town, St. Teresa de Avila Catholic Parish, St. Vincent de Paul Parish). The neighborhood also houses Children's Memorial Hospital (recently moved to Streeterville and was renamed Ann & Robert H. Lurie Children's Hospital of Chicago) and the currently closed Lincoln Park Hospital (formerly known as Grant Hospital and before that German-American Hospital), which is slated for redevelopment to condominiums, apartments, medical offices, and retail to be renamed Webster Square. The neighborhood contains a large number of upscale national retailers, boutiques, bookstores, restaurants and coffee shops. An Apple Store opened in October 2010, as well as a Lacoste store across the street. There are also many bars and clubs in the area.